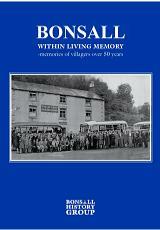 The new Bonsall history book is now available. It has grown from the first edition to 460 pages with over 100 new photos and new sections on work and leisure in Bonsall, prominent houses in the village and World War I.
Poachers "(Some) Bonsall men, including Joshua Wigley, Joseph Prince, Job Bunting and Charles Fearn, were at different times committed to hard labour at Derby County Gaol for poaching rabbits, hares and pheasants......"
Poultry Shows "The Pigeon Club and Horticultural Show ... have an illustrious past, holding large nationally important events in the later part of the nineteenth century. The first Bonsall Poultry Show was in 1883, 'for the exhibition of poultry, pigeon rabbits and canaries' at the Drill Hall ......."
Poverty "Framework knitters worked very long hours, sometimes up to eighteen hours per day, to increase their output. The depression in the hosiery industry and the very poor incomes of framework knitters prompted a government commission in 1840 to advise them: '... to flee from the trade and to beware of leading their children into it'. ...."
A full colour pictorial map showing a bird's-eye view of a Derbyshire hill village. It is crammed with illustrations, and historical and nature notes. 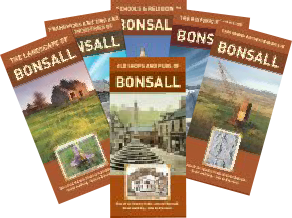 Produced, drawn, written and researched by villagers, the Bonsall Map is a celebration of our village's unique history. A richly layered document, it highlights not only the topography of the parish, but, in a series of articles on the back of the folded version, its geology and natural history; its past as a lead mining village; its businesses past and present, including farming, buildings, pigeon racing, carnival and well dressing, and present day facilities. Six leaflets titled Lead Mining & other Minerals; Framework Knitting & other Industries; Old Shops & Pubs; Schools & Religion; The Landscapes; and Historic Routes of Bonsall. 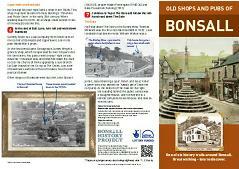 Each leaflet guides you around Bonsall pointing out the wealth of interesting history to discover. Bonsall at prayer (1066-1900) by John March, Dudley Fowkes & Pam McInally . St James's Church dominates the village from its rocky perch above Yeoman Street. It is likely that this prominent site held a place of worship long before Christianity. Chapels too, played an important part in the village's history. 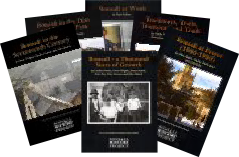 The first half of this booklet charts some of the milestones in the religious history of Bonsall; the second half details the architectural development of the church. Published May 2004. The population of Bonsall has hovered around a thousand from the end of the 17th century until the present when it has settled at around 850. But when lead mining was an important national industry Bonsall flourished, at one point being larger than Matlock. In the Industrial Revolution it reached its maximum of 1496 people. 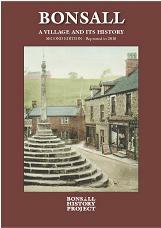 Beginning with the settlement's entry in the Domesday Book of 1086, this booklet examines surviving historical documents outlining the people who lived in Bonsall through the centuries and attempts to trace the growth of the village over the best part of a thousand years. Published January 2004. Nowadays when many villages struggle to support a single shop it's easy to forget that within living memory a village like Bonsall would have been virtually self-sufficient, alive with a variety trades and traders; from bakers and butchers, coopers and cobblers, to fish and chip shops, a milliners, frameknitters and a dozen pubs. Sub-titled 'Working with renewable materials', Peter Fellows' booklet examines Bonsall at work over the last 400 years. Among the trades it describes are leather working, rope making, food and drink production and sale, textiles, paper making, comb making and the wood industries. It's a fascinating journey through the village, crammed with stories of many different characters and the locations where they worked. Published November 2003. Fully illustrated with a huge number of superb pictures from 1920's to 2000's along with memories of the time.